Image: Jennifer Rotner via Flickr. 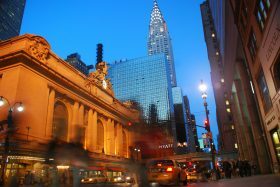 Developer TF Cornerstone and investment firm MSD Partners have announced plans to purchase and tear down the Grand Hyatt building adjacent to Grand Central Terminal, the Wall Street Journal reports. The hotel brand will eventually return to the site in a form different from the smoked glass-clad building that was Donald Trump’s first major Manhattan development. In its place will rise a mixed-use project that includes 2 million square feet of high-octane office space. The planned development is one of four new towers in the works as a result of a 2017 Midtown East rezoning aimed at encouraging new office buildings as well as infrastructure improvements in the east side business district.